Electric-powered Renault-Nissan sedan is one type of electric car Israel hopes will gain popularity in the next few years. TEL AVIV (JTA) -- In a land of high gas prices and no oil resources, Israel is positioning itself to lead the world into the age of the electric car. With $200 million in funding from private investors and enthusiastic support from the Israeli government, a young Israeli high-tech multimillionaire, Shai Agassi, is laying the groundwork for Israel to become the first test case for the gasoline-free electric car. His company is planning to establish a network of battery-recharging areas across Israel by 2011. 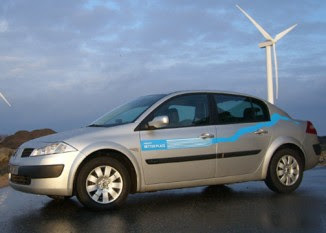 Renault-Nissan will begin introducing electric cars to the Israeli market as soon as next year. “What we are doing is something that should have happened already," says Dafna Agassi, the marketing director of the Israel office of Shai Agassi’s Project Better Place, which is based in California. “The consumer pays for gas, and the prices are going up every day. The solution is here: It's the electric car." Given Israel’s small size, dearth of oil resources and location in an oil-rich yet hostile neighborhood, the Jewish state is an ideal testing ground for the electric auto. Eager to reduce the country's dependence on gasoline and reduce car-generated pollution, the Israeli government already has pledged to offer significant tax incentives for buyers of electronic cars. If successful, the electric car venture could make Israel the world's leader in the industry. That's precisely what Agassi and the Israeli government want. "Think about what happened with Finland and Nokia -- it sprung an entire industry,” Dafna Agassi said of the mobile phone phenomenon. "We are starting the field here. Imagine bringing this to other countries and the potential impact is huge." The cars will run on lithium-iron batteries, provided by Project Better Place, that should last for about 124 miles before needing to be recharged. This should suit the typical Israeli driver, who on average drives fewer than 45 miles per day. For longer trips, battery swap stations will serve as a safety net, the company said. "Environmentally, I thought it's the best idea I've ever heard of, and secondly it made a lot of financial sense," said Idan Ofer, a leading Israeli businessman and the project's main investor. Ofer spoke to JTA by phone from his SUV, which he says he plans to trade in for an electric car next year. By "deploying faster than any other country on the planet," Israel will map out and discover the best ways to implement the electric-car system, he said. Project Better Place can then take that know-how to other countries and traffic-clogged cities. Ofer says he plans to bring the idea to China, where he has shares in a local car company. Renault-Nissan will be the first to bring its electric cars to Israel, but the market soon will open to other companies. "Zero emission, zero noise," Renault-Nissan Chief Executive Carlos Ghosn said when he was in Jerusalem in January to inaugurate the project. "It will be the most environmentally friendly mass-produced car on the market." Although electric cars are expected to reduce emissions and make Israeli cities quieter, they will still use fossil fuels. For the time being, the recharging stations will run mostly on coal and oil. By contrast, in Denmark -- which signed on to the project after Israel -- power stations are fueled at least in part by wind power. According to Ofer, whose family holdings include oil refineries, Israel is making a gradual transition to more environmentally friendly sources of energy for its power stations, including the country's most plentiful resource -- solar power. The major expense of an electric car is its battery. To tackle that challenge, Project Better Place is establishing a battery charging payment system similar to the way customers pay for the air time on their cellular phones. Car owners will not own their batteries. Those who purchase cars will pay monthly fees based on their expected mileage. Cars will be recharged both via plug-in charge units at malls and parking garages, and some 100 battery replacement stations along highways, where batteries will be replaced for longer journeys. Shai Agassi will be in Israel next week showing off the latest version of the electric car and offering test drives to members of the media.